I don’t love cleaning. I don’t hate cleaning. I have more of a love-hate relationship with cleaning. I know it has to be done… that doesn’t mean I have to like it. I get excited when I can find a cleaner or tool that will make cleaning easier. Well, excited may not be the correct verb, but it does make me happier. Really. I mean, if I’m going to have to clean (since the housecleaning fairies won’t visit my home), it is nice to find a cleaner that does what it says it will do. That cleaner is CLR Bath & Kitchen Cleaner. I really don’t have a lot of time, nor do I want to spend a lot of time cleaning. I’d rather be playing with my son, reading a good book, getting a tooth pulled… oh, sorry, I digress. 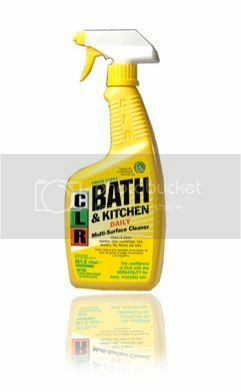 CLR Bath & Kitchen Cleaner is powerful and fast-acting. I know it’s going to help me clean my bathrooms and kitchen quickly and effectively. I really need that to fight the soap scum in my son’s shower. I think he has some kind of ritual he does with the body wash that causes extra soap scum. I picture him slathering the soap on the shower doors, thinking he is making my life more difficult. CLR Bath & Kitchen Cleaner takes care of the soap scum, though. So take that son! It is the best cleaner I’ve ever used to clean my stove top. I have an old Jenn-Air an it is wonderful to get the grease splatters and leave my stove looking shiny and new. And if you have calcium, lime, and hard water stains, CLR can take care of it for you. Oh, and I almost forgot the best part – CLR Bath & Kitchen Cleaner has the Environmental Protection Agency’s “DfE” (“Design for the Environment” designation), meaning its safer chemistry is not harmful to everyone in your home. That makes me feel better about using it in my home, around my family. Thanks for this post. Whatever way that cleaning will be easier, I am all for it!!! This sounds like really good stuff!! I really need some of this, my tub has some terrible stains that I can’t seem to get out to save my life! my mom uses this stuff! The origial CLR is awesome! I will have to try this one too. I love CLR as well, it really gets rid of those hard water stains in my kitchen and bathroom! I sooo need this!The hard water is wreaking havoc on our shower! That’s some good stuff. If you’re sensitive to chemicals (I am) make sure to air out the room.